Each year over 200 Christians come together to walk along the banks of beautiful False River, located in Pointe Coupee Parish, LA, on Good Friday to Pray, Worship, Offer Sacrifice and give Glory and Praise to God. On this day we remember the Passion of Our Lord by walking the Way of the Cross. Our walk will start at IMMACULATE CONCEPTION Catholic Church in LAKELAND, LA. The walk is approximately 11.2 miles making 13 stops along our journey before reaching ST. MARY'S Catholic Church on Main St. in NEW ROADS, LA. At each stop we remember a particular event in the last days of our Lord: When He is Condemed, the Scourging, the Crowning of Thorns, Carring of the Cross, the Crucifixion, and His Resurrection. We hope you enjoy browsing our site and find all the information you need about our walk. Please feel free to contact us if you have any questions. Our photo albums can give you a view into our past walks. It truly is an experience to remember. 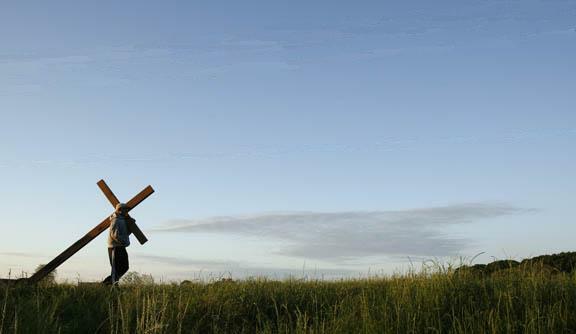 Everyone has a chance to WALK IN HIS SHOES by carrying the Cross. It's not an easy journey but it's nothing compared to what Jesus did for us.